Last year, I shared an opportunity for residents to weigh in on a potential bike trail through Southborough. The BWALT proposal is for a “multi-use path” to allow safe area commuting by bicycle. Trails would potentially link up Southborough to Marlborough and Westborough, with possible connections to Northborough and Berlin. From Berlin, cyclists could even link to the Mass Central Rail Trail. Although the “Boston Worcester Air Line Trail” is clearly rooted in a rail trail, the concept plan would require some non-rail based portions for Southborough connections. This talk will look at the history of the trolley and the railroad whose right-of-ways are used for the trail. A discussion of the economic benefits of the trail and the planned route will be included. . .
Don will also present a short guide to walks that can be done on the BWALT now. You can read more about the project on the BPAC’s website. 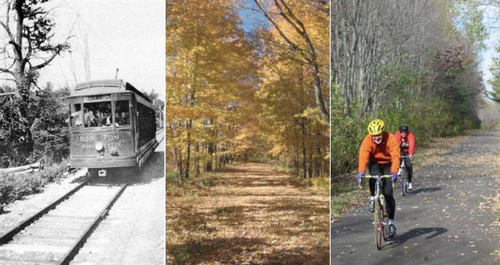 Don envisioned the Westborough Charm Bracelet walking trail, and the BWALT multi-use trail. Additionally, Don was active in the development of the maps for paddling the Assabet, Sudbury and Concord rivers, and in the creation of the Boroughs Loop Trail through Marlborough, Southborough, Westborough, and Northborough. The presentation will be at 1:30 pm at the Southborough Senior Center. Refreshments will be served. Please sign up at the front desk or call 508-229-4453. *Burns also gave a talk at the Southborough Library in September that was sponsored by the Southborough Trails Committee.